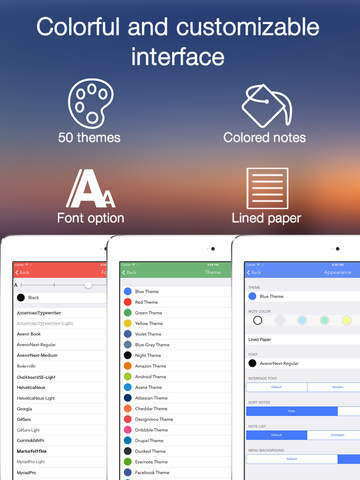 Note-Ify - simple, beautiful and usable notes with reminders. APPLEINSIDER: "A good alternative to the standard notes. "It is known that not all owners of iOS-devices like the standard applications. FNotes is a great way to forget about one of them. They are simple, beautiful and usable. And most importantly - their can be personalized. 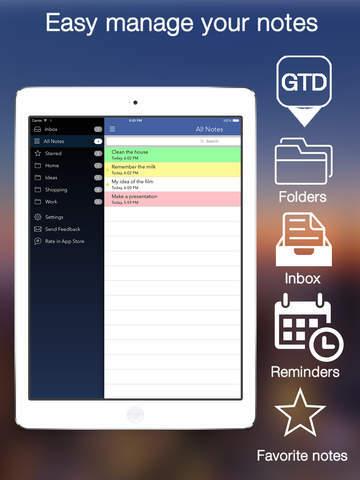 Additionally, you can set passwords to specific notes, create folders, synchronize content with Dropbox, and more." APPLEDIGGER: "FNotes - this is the best alternative to standard notes"
YABLOCHNO.COM: "FNotes - a new look at the familiar notes ... FNotes application is qualitative and useful. Having the ability to set a password on a note, synchronization and customization of appearance make it a good alternative to the standard notes"
Notes are customizable, so you can change fonts, themes, color of notes. Also you can set a password lock to protect your data, quickly send a note to the favorite address, share tweets and send it to another device via AirDrop or SMS. 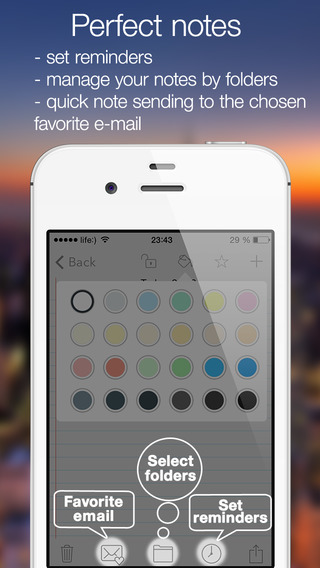 - Select important notes by using the "Favorite Notes" or by setting a color to them. * Sync via DROPBOX: it means, then that data is synchronized via a special database (Dropbox Datastore), it does not sync files, this is a synchronization of the records in the database notes.